Does your tuna measure up? Why have tuna sales in America dropped significantly? Tuna still is the most popular canned fish of all time, but health concerns involving the packaging is playing a part in the diminishing popularity of the food. This, as well as the poor quality and safety of the food itself, environmental concerns regarding overfishing, and unintentionally harming other aquatic life. Does your tuna measure up? Read on to find out. Greenpeace has created a comprehensive guide showing which major brands of canned tuna were able to follow sustainability guidelines, like not overfishing, eliminating bycatch, treating their workers humanely, and properly labeling their products. Many of the largest named brands in their investigation were found to have the worst ratings for sources, sustainability, and overall quality of product. The environmental concerns along with the potential health risks of these products have given consumers key points to consider when they are buying their canned tuna (if they still do). This list looks dubious when you’re talking about mercury because the first three or four on the list are albacore tuna which is the white tuna that is three times higher in Mercury than skipjack. 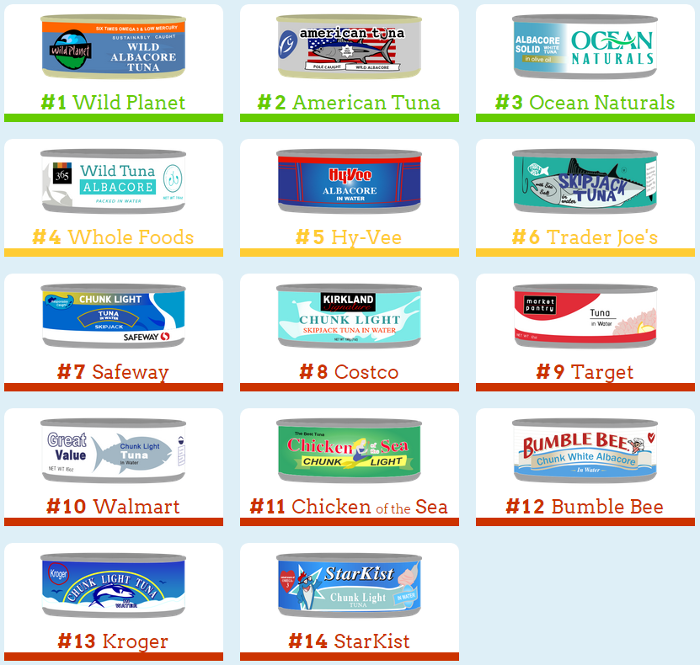 So how can you say that these albacore brands have less mercury then the Trader Joe’s skipjack? It seems we are more concerned about the safety of the oceans than we are about the health of human beings, namely our children. We should be fishing responsibly, but what about the consumption of mercury? To Hell with BPA and mercury. Worry about radiation! Don’t eat anything that came from the Pacific Ocean. FukUs-hima has dumped more than 300 tonnes of radioactive waste into the Pacific every single day since the man-made, planned disaster. And, it continues with no end in sight. It’s an ELE (Extinction Level Event) that is killing the Pacific and will eventually kill all oceans. The floor of the Pacific is covered with dead sea life. Since mankind hasn’t the technology to solve this problem, it’ll require divine or extraterrestrial intervention. I was thinking the same thing about radiation contamination from Fukushima disaster that occur about four years ago and it’s got a lot worse than ever before.